Paula's Choice Clinical 1% Retinol Treatment - This potent anti-ager uses a uniquely formulated retinol solution to hydrate and deliver high-performance ingredients directly to the skin. Plus, thanks to the controlled-release delivery system, you can be sure these are delivered evenly and consistently across your complexion. REN Skincare V-Cence Revitalising Night Cream - Putting the ‘beauty’ back in ‘beauty sleep’, this Revitalising Night Cream from REN is specifically formulated to recharge, revitalise and intensively hydrate skin overnight. With an active complex of essential micronutrients, the cream visibly smoothes fine lines, evens skin tone and offers antioxidant protection to help combat the signs of premature ageing. Olay Regenerist 3 Point Day Cream SPF30 - Easily absorbed and non-sticky, this day moisturiser with SPF 30 makes a great base for make-up. It’s been tested by over 500 Good Housekeeping readers and is Reader Recommended. Not only that, it’s been approved by the Good Housekeeping Institute experts too! Charles Worthington Volume & Bounce Body Booster Mousse - Applied root-to-tip on damp hair before blow-drying, this volume-boosting mousse with added collagen injects body, weightless bounce and control into lifeless hair. Special style-memory technology in the formula helps give you volume that lasts, too. Sanctuary Spa Ultimate Salt Scrub - This iconic salt scrub is packed with a rich mix of jojoba, coconut and almond oils to leave skin gorgeously polished and moisturised. A must-have for Summer! Caudalie Vinoperfect Radiance Serum - A great treatment to fade dark spots – and help prevent them in the first place. This serum contains Viniferine, a natural extract of grapevine sap, which also helps to even out and brighten skin tone. Use it twice daily under your moisturiser. Garnier Skinactive Moisture Bomb Tissue Mask - For a super-hydrating treatment, pop on this hyaluronic acid-packed sheet mask for just 15 minutes, then massage in any excess product. Suitable for sensitive skin, it helps minimise fine lines and gives skin a gorgeous glow. Nails Inc Nail Polish - Combining fashion-forward nail polish shades with high-tech, innovative formulations, Nails inc is a leading brand not just for nail colour but for nail-care treatments, too - Shades may vary. Regenerate Enamel Science Advanced Toothpaste - Help protect against enamel erosion caused by acid attacks by brushing twice a day with Regenerate toothpaste. Backed by clinical trials, it helps teeth look whiter and brighter, and has just recently achieved GH Reader Recommended status. James Read H20 Tan Mist - Make fake-tanning a breeze with James Read’s H2O Tan Mist, infused with pure rose water. Gentle enough to use every day, the lightweight formula gradually builds a natural, golden glow and gives your complexion a boost with the help of skin-loving vitamins and minerals. Urban Beauty United Powder Brush - A make-up bag essential, this versatile natural-bristle brush is an ideal choice for when you need to apply any kind of powder. Use it with loose or pressed finishing powder to set your look, or with highlighter and bronzer for perfectly contoured cheekbones. What I love about this box is that there are so many amazing high street brands coupled with a few higher end brands and they are all really good sizes. Priced at just £35 HERE it has a value of £128. What do you think to this box? This looks absolutely amazing! It's the first beauty box that I've really wanted for ages! I LOVE the Charles Worthington mousse, I swear by it for volume! I also love anything by Sanctuary! Ohh the Paula's choice!!!! Love!!!!! It's great that you get a full sized Nails Inc nail polish. Nothing else really tempts me to purchase this box. 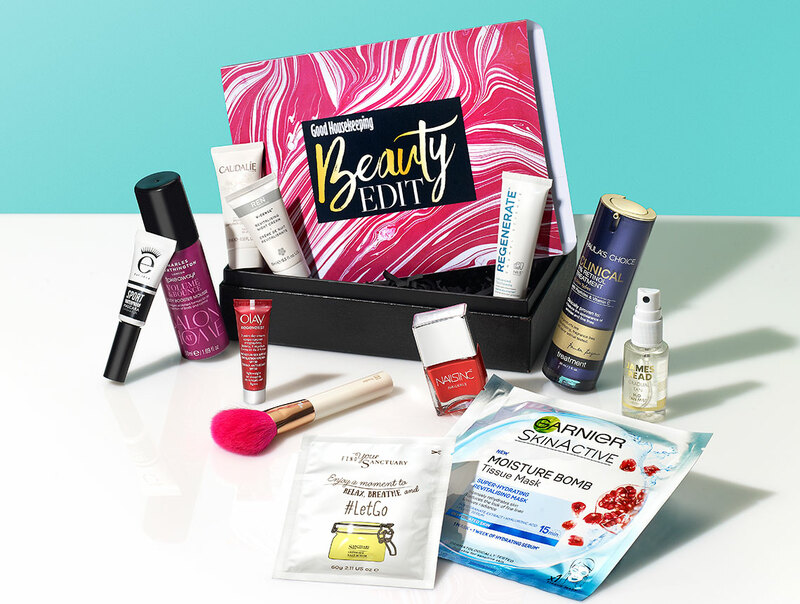 I do love Latest in Beauty's build your own box options right now, so I might treat myself to one of those instead. You get so many products! This looks like a fab box. Looks like a lovely mix of products, I really like the sound of the Sanctuary Spa salt scrub! I haven't heard of this before, it sounds great value for all those products. This looks like a fantastic box, I can't believe how many products there are in the box that I would actually use. I often find beauty boxes to be very hit and miss. Looms like a brilliant box, I love how there's such a wide variety of goodies inside! So many amazing brands - wish I would get it in NZ! Wow so many amazing products in this! I love this beauty box - what a great idea! I might have to hint to get this as a birthday pressie... some really nice products. Fab box, everything looks and sounds really interesting! Everything in the box looks great. I would love to try the mascara and sheet mask.